John Singleton produces Straight Outta Compton, a biopic about one of the most influential groups in hip-hop history. N.W.A. changed the genre by producing music about the harshness of the West Side, more specifically, Compton. While on the East Cost the rap game seemed to be more about flashy rides and the rich lifestyle, the West Coast was fighting racism, police brutality and gang violence. This sparked life into a new sound and a new type of music pioneered by Dr. Dre and Ice Cube. And so reality rap was born. With Eazy-E’s financial backing; it was rumoured that he made hundreds of thousands per month selling narcotics; the N.W.A. was formed. This film pays close attention to detail and that is what makes it so impressive. This was not a half-baked effort that piggy backed off the success of Dre and Ice Cube’s careers. Straight Outta Compton is well-written, perfectly timed and it tells the story the way it should. Although it does tend to cast a shadow over the groups more questionable actions it still remains brutally honest to the bone. With a film like this you expect the score to be its strong suite but the acting is even greater. Corey Hawkins and Jason Mitchell bring their best performances yet. As the story progresses you can’t help but feel that their acting is improving too. From the smirks and facial expression to the movements and mannerisms, these actors have taken notes and made sure that this opportunity would showcase their talents. 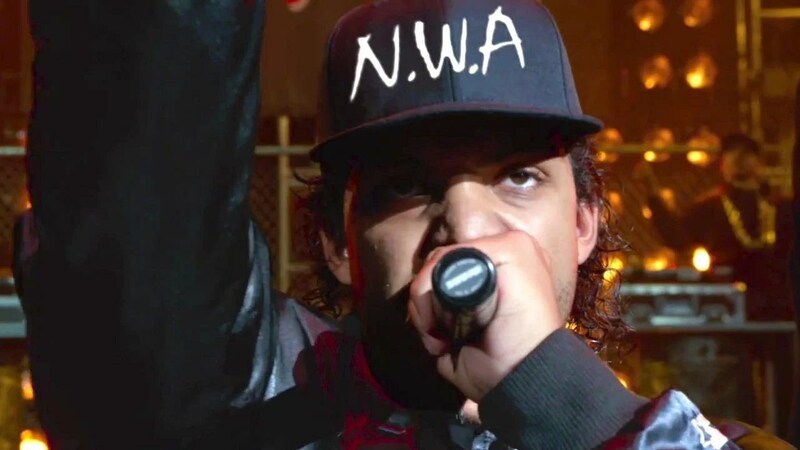 But no one is more impressive than O’Shea Jackson Jr. His father, Ice Cube, told him that he had to earn this role and boy did he not only earn it, but he owed it. It is truly a strange experience, while you know the others are acting you feel that you are witnessing Ice Cube in real time! He is the splitting image of his father and he is able to pull of those signature facial expressions with perfection. This movie focuses on the formation of the group; their rise to popularity and the problems that come hand in hand with fame and fortune. Friendships are lost, rivalries are born, but in the end history is made. This biopic documents it all, even the dark side of the story — such as the death of Dre’s brother, Suge Knight, Death Row Records and the untimely death of Eazy-E. But there is plenty to celebrate, Straight Outta Compton takes you on a trip down memory lane and you get cameos that will make you feel as though you are watching a film that is like “The Avengers” of Hip Hop. In today’s delusional version of Hip Hop and Rap, this movie sheds light on what this genre should be about; honesty and lyrical genius — something that is missing in the game today!